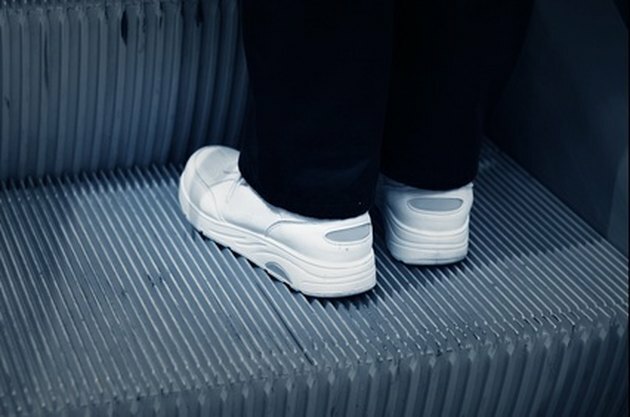 Everyday scuff marks and dirt can stand out on white sneakers. Nike Air shoes are made out of canvas material, which requires special cleaning. It's best to spot clean sneakers whenever possible instead of throwing them into the washing machine. By cleaning them on a regular basis, and avoiding setting stains and grime buildup, you won't have to spend as much time cleaning white Nike Airs in the long run. Take out the shoelaces and set them to the side. Dampen a cloth and run it over both shoes. Fill a bowl with warm water. Add a dime-size amount of liquid dish soap. Mix the water with an old toothbrush until the water becomes sudsy. Scrub the outside of the sneakers with the wet toothbrush. Wash the shoelaces in a load of laundry. Let the shoes and laces dry outside. Clean-looking kicks are key to any Air Max look, athletic or otherwise. Get yours looking like new again with regular cleaning.